Steinke worked for Gemini Air Cargo from 1996 to 1997, according to a 2016 Department of Transportation document cited by McClatchy. Moreno, although he did not work for Gemini, registered two separate businesses at a Miami address that was later registered to Gemini Air Cargo while the CIA rendition program was active. McClatchy noted that the first business Moreno registered at the location was incorporated in 1987 while the second was created in 2001. Gemini Cargo Logistics, a subsidiary of Gemini Air Cargo, was subsequently registered at that same location in 2005. BOGOTÁ, COLOMBIA – Several troubling situations are currently playing out across Colombia, yet the country’s continuing downward spiral into drug-fueled and politically-motivated violence has caused little concern in Washington, offering yet another clear indication that the U.S.’ current posturing on Venezuela is hardly motivated by concerns about “democracy,” “human rights,” or the welfare of the Venezuelan people. Though it was Barack Obama who first deemed Venezuela a “national security threat” and re-initiated draconian sanctions against the oil-rich nation, the Trump administration has greatly increased the sanctions targeting Venezuela, often citing its government’s alleged participation in illegal drug trafficking as justification for doing so. However, the U.S. has offered little in the way of concrete evidence to back up those allegations. A Colombian Campesino leader Dilio Corpus Guetio, 44, who was a member of Asocordillera (Mountain Area Association of Campesino Workers) and also a member of the local Campesino Guard militia was shot to death Tuesday. Corpus Guetio left his home in the municipality of Suarez in the department of Cauca, in southwest Colombia, at around six in the morning for work. On the way armed men from a car shot him several times. “The murderers were in a van which hit him and made him lose control of his bike. At that point, they got out of the car to get close to Dilio, who was already injured and he was shot repeatedly, killing him,” said a representative from the United National Federation of Agricultural Unions (FENSUAGRO). 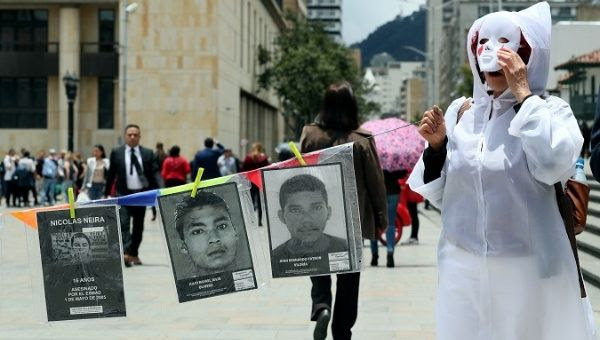 Studies for Development and Peace, Indepaz, say that within the 29 days of 2019, 16 social leaders have been killed in Colombia, excluding Corpus Guetio. Dilio was known for his work monitoring rural areas and protecting the territory and its inhabitants. His murder case has been registered in the village of Santa Barbara, his place of work. This week another community leader from Cuca, Jose Jair Orozco, 52, was also assassinated. Colombian Attorney General Nestor Humberto Martinez said in early January that the greatest number of Colombians murdered over the past two years since the signing of the peace agreement have been social leaders who serve on Communal Action Boards (JAC). JACs began in the 1950s and are local-level councils where citizens decide upon, plan and develop community projects based on their own needs. The majority of JACs are in rural areas and members include mainly low-income Campesino, Indigenous, and Afro-Colombian members of society. According to Martinez, the assassinations of JAC leaders is “passively systematic.” The attorney general said that those responsible are paramilitary groups “such as the “Gulf Clan” that works on behalf of narco traffickers and “Los Caparrapos” he added. Indigenous people made up 13 percent of those killed and farmers 10 percent. Union leaders and social leaders, Afro-Colombians and LGBTI population were the other main murder victims. Following a sharp increase in Venezuelan migration since 2015, the corporate mainstream media, alongside the governments of the US, EU and Colombia, is aggressively pushing the narrative of a “humanitarian crisis,” at the same time that Western NGOs flock to set up shop along the Colombian border. But what if NGOs are being used to influence how the movement of people from Venezuela into Colombia is being shaped and reported, and what’s more, if they are directly benefiting from this situation? To explore the idea, we focus on one such NGO, US-based Mercy Corps, which recently announced an expansion of its operations on the Colombo-Venezuelan border. Mercy Corps’s budget for global operations, on the order of US $500 million (according to its 2017 annual report), includes funding from US and EU government agencies. Its financiers have included the UK’s International Department of Development, which has regularly sent aid via Mercy Corps to rebel-held areas in Syria. Other funders include the Bill and Melinda Gates Foundation and the Clinton Foundation. In March 2018, Mercy Corps carried out a “rapid needs assessment” (RNA) of Venezuelan migrants arriving at two main points along the Colombian border. The information gathered was used to “demonstrate” the dangers involved during and after crossings from Venezuela, and the reasons for leaving the country. It is in response to this second question that the people interviewed by Mercy Corps all say the same thing: they are migrating due to an economic crisis in Venezuela, which is linked to hyperinflation. However, Mercy Corps is not concerned with narratives that expose US and EU complicity, and as such, its recommendations fail to include the most obvious point: end the sanctions and stop the hostility towards Venezuela as they are inflicting hardship on its population. Instead, Mercy Corps’ RNA identified 3 basic needs to be met by the Colombian government: a path to legal entry into Colombia that did not involve passports, the legal right to work in Colombia with the same wages and protections as Colombians and access to shelter, food and water. It is on this third point which Mercy Corps looks to fish for substantial (tax-free) donations and financing from the Global North. In April, the Colombian government agreed that migrants could register, without passports, at any of the 500-plus checkpoints it would set up along the border over a two month period, to end in June. The reason given was to see how many Venezuelans were entering Colombia. The checkpoints were spread along the 1,500 mile border. Any information supplied by migrants at the checkpoints would be retained by NGOs, not passed to government departments. By August, the Colombian government agreed that nearly half a million Venezuelans could remain in Colombia for up to two years, look for employment and have access to basic services. The reason given for this change was to accommodate humanitarian needs. This shift in policy was a reversal of the government’s ruling in February, when up to 3,000 Colombian soldiers were stationed along the border to check for passports. This tightening of rules was referred to as a “diplomatic closure” and the government claimed in a short time the number of migrants fell by 30%. Yet within a few weeks Bogota U-turned its policy to allow the unhindered movement of Venezuelans, and NGOs such as Mercy Corps were conscripted to enable the process. The new policy of the Colombian government met exactly the needs identified by Mercy Corps, suggesting that the campaign for this migration was an international, organised effort. In October of this year, Mercy Corps announced they are expanding their services on the border, including providing migrants with a debit card to purchase products. Yet, one out of every three Venezuelans attended by Mercy Corps did not see any improvements to their diet in the two weeks since arriving to Colombia, and 12 percent reported that it had worsened. Since the Colombian government changed its policy, the number of people leaving Venezuela has increased, according to the Migration Policy Institute, an organisation affiliated to the EU. The situation of Venezuelan migrants is now being called a “regional humanitarian crisis,” creating a picture of unimaginable catastrophe that needs external intervention. This escalating crisis narrative of an expanding exodus is placing Venezuela under intense scrutiny. While punishing Venezuela with sanctions from the front, and promoting a migration crisis from behind, the EU and US, with the cooperation of Colombia, are attempting to box Venezuela into a more isolated and vulnerable position. Colombia has enjoyed close ties with the EU, and soon after changing its policy on Venezuelan passports, it became a NATO partner, further cementing its EU and US dealings. This ballistic development means that the consequences of border conflict, fuelled by a recent movement of 5,000 extra troops to the Catatumbo border region, should be taken very seriously. Meanwhile, Mercy Corps has consistently driven a narrative of a full-blown humanitarian crisis and rampant violence under President Maduro, including unfounded allegations of repression and torture. For instance, the NGO has made the unsubstantiated, hyperbolic claim on their website that “newborns in Syria have a better chance of survival than those born in Venezuela today,” wich clearly looks to stoke the fire. Harnessing its “independent charity voice,” Mercy Corps is playing its part as a propaganda tool in vilifying the Venezuelan government, enabling its US and EU funders to continue their sanctions, which only worsen the economic hardship of average Venezuelans, the root cause for leaving their country, as explained in Mercy Corps’ own needs assessment. And whilst all this goes on, Mercy Corps gleefully rakes in ever greater funding so as to “attend” to the “humanitarian crisis” they, together with the mainstream media, have played a key role in manufacturing. However, beyond playing a role in the international media war, Mercy Corps is intimately linked to the Washington policy-making establishment that has formulated the US policy of illegal, unilateral sanctions. Mercy Corps is connected to the influential US Council on Foreign Relations (CFR) through its CEO Neal Keny-Guyer, who declared earnings of $460,000 just for his Mercy Corps role in 2017. Apart from being a member of the CFR, he also serves as chairman for Interaction, the US’ largest alliance of NGOs and sitting on the World Economic Forum’s Global Agenda Council on Fragility, Violence and Conflict. The CFR, a virtual who’s who of America’s wealthiest and most powerful people, claims it “helps policymakers” on “international peace and stability,” whilst actually pushing Washington’s neoliberal agenda and interests around the world. The president of the CFR is Richard Haass, Middle East advisor under George Bush, and advisor to Colin Powell under George W. Bush. On his 2016 election win, Donald Trump publicly considered Haass as an advisor. The CFR president recently displayed his frustration that US-backed military coups and UN- sanctioned military intervention in Venezuela, all of which would create a further migratory exodus, were taken off the table, despite ongoing rumours from the White House, Bogota, and even Brasilia, that they may be be possible. In February the CFR made a Preventive Action Plan which recommended more economic sanctions for Venezuela, and in May more US sanctions were imposed. Whilst sanctions have helped create the conditions which drive people out of Venezuela, US government aid has flowed to NGOs in Colombia, to which Mercy Corps has taken its chunk. Mercy Corps’ 2017 financial statement shows that the organization benefited from US $464,452,000 in governmental grants and private backing alone, only spending $139,876,000 in humanitarian relief and $46,699,000 in humanitarian recovery. Of this humanitarian relief, the vast majority was spent on the mysteriously entitled “subgrant” category, and only $21,753,000 on actual materials and supplies for migrants. The CFR also included an aid plan for Venezuela which called for State Department funding for the Bureau of Population, Refugee and Migration (PRM), an organisation which finances Mercy Corps. In August, the US announced an aid plan at the United Nations Assembly General (UNGA), matching the plan set out by the CFR. Indeed, the CFR is explicitly advocating illegal smuggling as a means of destabilizing the elected government in Caracas. Meanwhile, smuggling is a problem for Venezuela, but not in the terms described by the CFR. On the contrary, Venezuela has suffered from extensive smuggling of subsidized goods and fuel into Colombia, exasperating shortages and as such generating more inflation. This game played by think-tanks and policymakers reveals Washington’s glaring double-standards vis-a-vis Venezuela. While they help to create and exploit the need for basic foods and medicines in another hemisphere, roughly 45,000 of their own people die each year through lack of health care. Around 30 million Americans have no medical cover at all, roughly the population of Venezuela, which has health care written into its constitution. At the same time, the US is deporting tens of thousands of Hondurans, while more attempt to cross the border into the US every day, a legacy of Hillary Clinton’s 2009 adventurism. Yet, we are constantly told to believe that Washington cares about migrants and the well-being of Venezuelans. While US policymakers play games around Venezuela, with toys from the imperialist toolbox, along with their EU friends, it is no wonder Maduro fears assassination. This article is a combination of two texts by Nina Cross, the first of which was published by the Morning Star, edited by Venezuelanalysis. The systematic targeting of social leaders and former FARC guerrilla fighters has become one of the main obstacles to peace in Colombia. In Colombia, two former combatants of the demobilized Revolutionary Armed Forces of Colombia (FARC) were attacked in the Cauca department. One of them, John Faber Gomez, who was also a member of the National Protection Unit, died as a result of the wounds he sustained. The armed attack took place after the Colombian government authorized the new Temporary Hamlet Zone for Normalization in the municipality of Patia, to replace the abandoned hamlet zone in Policarpa, Nariño. The Common Alternative Revolutionary Force (FARC) party condemned the attack and demanded security guarantees from the government. “Peace is in mourning. In the Cauca department, a member of the National Protection Unit and our party @FARC_EPueblo was murdered, 72 former combatants have already been murdered. #WeDemandTheRighttoLife #ThatPeaceDoesNotCostUsOurLives #WeWorkForPeace #TheyAreKillingUs,” Pablo Catatumbo tweeted Monday. The systematic targeting of social leaders, human rights defenders, and former FARC guerrilla fighters has become one of the main obstacles to peace, especially because the state has failed to guarantee control over the territories left by the demobilized FARC. In the framework of the United Nations General Assembly, the U.N. Secretary-General, Antonio Guterres, met with Colombian President Ivan Duque to ratify his commitment to the Colombian peace process and stress the urgency of providing security and development to conflict zones. Cauca, Nariño, and Antioquia are the departments that record the highest number of murders. Human rights organizations have denounced the country’s General Attorney’s Office for lacking an investigation strategy that takes into account the existence of paramilitary groups, and the systematic nature of the murders against former combatants and social leaders. After it emerged that the former president Juan Manuel Santos recognized Palestine as an independent state just before leaving office, Colombia’s new government has pledged to “cautiously” review the decision and its implications. Palestine was described as a “free, independent and sovereign state” in Santos’ August 3 letter to the Palestinian representative in Colombia, which was only made public on Wednesday. “Just as the Palestinian people have a right to constitute an independent state, Israel has a right to live in peace alongside its neighbors,” it added. The Palestinian representative welcomed the announcement, expressing hope it will “contribute significantly to generating the necessary conditions in the search for peace in the Middle East.” Palestine is currently recognized as a sovereign state by the UN, the International Criminal Court and at least 137 countries. Colombia’s new president, Ivan Duque, took office on Tuesday in an inauguration ceremony attended by visiting US ambassador to the UN, Nikki Haley. Colombia was one of the few states that abstained from voting on a US General Assembly resolution that urged the US to rescind its recognition of Jerusalem as Israel’s capital last December. Colombia’s incoming Defense Minister Guillermo Botero is planning to “regulate” anti-government protests by only allowing demonstrations if they are previously approved by authorities. The announcement was made by Botero during a summit attended by USAID director Mark Green and former U.S. vice-president Joseph Biden. Restricting anti-government protests, which appears to go in contradiction to some parts of the ongoing peace process, was the first proposal made by Botero after being appointed by Duque. Outgoing president Juan Manuel Santos vowed to release jailed participants in protests that turned violent during major social tensions between neglected or discriminated communities and the authorities, according to Colombia Reports. Over the past decade, the overwhelming majority of protests were held by historically neglected groups, mainly Indigenous groups and African-descendant communities. They also included labor unions, campesinos, teachers, as well as political opponents to the government. Botero’s proposal comes amid a surge of assassinations and death threats against human rights defenders and social activists. Colombia’s inspector general, Fernando Carrillo, has accused elements of the country’s police and military of collaborating with criminal organizations to assassinate human rights defenders and community leaders. “State agents are co-opted by criminal organizations that are eliminating social leaders,” the official said on Wednesday. Carrillo’s office is one of the state departments tasked with investigating the murders of at least 311 social leaders since 2016. Another Colombian social leader was reportedly murdered in the municipality of Caloto, Cauca, a national human rights network confirmed Monday. The father of a former FARC soldier, an active participant in the Association of Pro-Constitution Workers Zones of the Caloto Campesina Reserves, Luis Eduardo Dague was a leader in his community. He assisted in founding the Carmelo of the Municipality of Caloto Cauca community and worked on the El Carmelo Action Board and various union, trade, and agricultural groups, the human rights network Francisco Isaías Cifuentes reported. Dague’s remains were found in the El Carmelo Monday morning with marks consistent with torture across his body, face, and neck. Experts say Dague was most likely stoned or beaten to death. According to local reports, a group of soldiers was camped on property owned by the victim near the crime scene. This is the second murder registered in Cauca this week. On Sunday, the body of Jose Bayardo Montoya was found in Miranda, also allegedly beaten to death, his skull completely crushed. Late last week, Colombia’s inspector general, Fernando Carrillo, accused elements of the country’s police and military of collaborating with criminal organizations to assassinate human rights defenders and community leaders. While earlier this month, demonstrations were organized in Paris, Valencia, Barcelona, Berlin, Brussels, London, New York, Rome and Buenos Aires to protests the violence targeting social rights leaders. Despite government promises from outgoing President Juan Manuel Santos to address the paramilitary violence, the number of fallen social leaders continues to climb with over 400 deaths since the signing of the Peace Treaty signing in November 2016. Colombia’s National Liberation Army (ELN) has refuted allegations by the General Prosecutor that the group is responsible for the majority of social leaders murdered since the peace agreement was signed in 2016. “The Prosecutor’s Office must stop participating in the ‘war of information’ and we urge the government to show its willingness to stop this extermination,” the ELN tweeted. The exchange followed a flurry of reports released by various social organizations earlier in the week, which variously accused the government and paramilitary groups of complicity in the killings. One report, entitled ‘All The Names, All The Faces,’ names 123 of the 125 social leaders murdered between January 1 and July 4 this year. The two additional victims were murdered immediately after the report was published. Another report on assassinations between 2002 and 2015 revealed that the majority of the murders aren’t related to Colombia’s half-century internal armed conflict, but are perpetrated by state security forces. Colombian President-elect Ivan Duque has vowed to not send an ambassador to Caracas upon assuming the presidency, claiming not to recognise the Venezuelan government in heated statements less than two weeks after his electoral victory. “We can’t accept having links with a government which we consider to be illegitimate,” declared the winner of the June 17 election. Duque obtained 54 percent of the vote amid a 53 percent participation. Venezuela’s May 20 presidential elections were declared free and fair by numerous international accompaniment missions who observed the process in the Caribbean nation. By contrast, Colombia’s recent balloting has drawn significant criticism, with Colombia’s Immediate Reception for the Electoral Transparency Unit (URIEL) registering 1,239 complaints on the day of voting, 51 percent of which referred to “pressure and threats” to voters. Duque is considered a hard-line politician of the right wing Democratic Centre center who is extremely close to party head and ex-Colombian President Alvaro Uribe, both in his rejection to the Colombian peace process and in the aggressive tone taken in relation to Caracas. Nonetheless, the new Colombian president has threatened to denounce his Venezuelan counterpart at the UN Security Council. Duque has also promised to withdraw from regional body UNASUR for its “complicity” with Venezuela. The tense relations between Colombia and Venezuela since 1999 have not stopped the abundant, migration between the two populations. It is estimated that more than five million Colombians entered Venezuela fleeing the civil war and government persecution. Likewise, recent data suggests that more than one million Venezuelans have crossed into Colombia in the past two years. Nearly every day, we are bombarded with “news” about problems in Venezuela. And certainly, there are problems, such as food and medicine shortages and skyrocketing inflation. But there is something that is downplayed. What the press downplays, if it mentions it at all, is the very real and significant ways that US sanctions have contributed to these problems facing Venezuela and how these sanctions are making it nearly impossible for Venezuela to solve these problems. What the press also fails to mention is the even greater humanitarian issues confronting Venezuela’s next-door neighbor, Colombia – the US’ number one ally in the region and, quite bizarrely, the newest “global partner” of NATO from Latin America. And, the US is very much responsible for these issues as well, but in quite different ways. The fact is that, by a number of measures, Colombia has one of the worst human rights situations on earth, but you would never know this from watching the nightly news. First of all, Colombia has the largest number of people forcibly disappeared in all of the Americas – even more than all of the Southern Cone countries combined during the infamous ‘dirty war’ years – at over 60,000. In addition, Colombia has one of the largest internally displaced populations on earth at well over 7 million – second only to Syria. And, a disproportionate number of these internally displaced are indigenous and Afro-descendants. Colombia is also one of the worst countries in the world to be a social leader, such as a human rights defender, union leader, indigenous or Afro-Colombian leader. Thus, even after the signing of a peace deal between the Colombian government and FARC guerrillas in 2016, social leaders are being murdered at an alarming rate. Indeed, over 200 social leaders have been killed just since January of 2017. Last year was in fact the worst year on record for human rights defenders in Colombia, with 120 killed in 2017. Of course, the US has a large responsibility to bear for this awful situation in Colombia, as it has been the intellectual author behind Colombia’s brutal, decades-long war against its own people and has provided billions of dollars of material aid to this war effort. Indeed, since 2000, the US has given Colombia $10 billion in mostly military assistance as part of its counter-insurgency program known as ‘Plan Colombia.’ During the Plan Colombia years, the Colombian military attempted to boost US military assistance by murdering civilians in cold blood and passing them off as left-wing guerillas. It is now believed that the military killed 10,000 civilians in this grisly “false positive” operation. But the US is also behind an even darker force than the Colombian military – that is, the Colombian paramilitary death squads. While those who live in the more remote parts of Colombia are painfully aware of the paramilitaries’ presence and brutality, the paramilitaries are now a well-kept secret in the more well-to-do parts of Colombia’s big cities and even more so outside of Colombia. Indeed, the Colombian and US governments deny the very existence of these paramilitary groups, and the compliant press is happy to oblige in keeping this dirty secret. Of course, as Father Giraldo has explained on numerous occasions, the ostensible “sympathizers of communism” targeted by the paramilitaries are trade union leaders, human rights defenders, peasant leaders, and Catholic priests who advocate on behalf of the poor. As for Catholic priests, over 80 have been murdered since 1984 for the crime of advocating on behalf of the poor. It is now becoming more evident than ever from the fact that there is now a rise in the murder of such social leaders, as well as mass forced displacement, after the disarming of the FARC guerrillas, that it, is the paramilitaries which are responsible for the lion’s share of such human rights abuses in Colombia. But again, you would have no idea about this from reading the newspapers or watching the nightly news. And, Colombians who are suffering at the hands of the paramilitaries are painfully aware of the conspiracy of silence around this issue. Indeed, when I was recently in Colombia for the first round of the presidential elections, our delegation met with a number of residents of the small town of Suarez (Cauca Department) which had just lost three members of their community to paramilitary violence. One of the members of the community desperately asked us, “what can we do to let the world know of the continued existence of the paramilitaries?” I answered that we have been trying to do just that for many years, though few will hear us out on this issue. While we were in Colombia, a campaign coordinator for Gustavo Petro, a Colombian presidential candidate, was murdered by paramilitaries the day before the election, and the paramilitary group known as ‘Aguilas Negras’ (Black Eagles) issued a general threat against the supporters of Petro for president just a few days before the May 27 vote. If Colombia’s very real human rights and humanitarian crises were given nearly the attention that the problems in neighboring Venezuela receives, the US and Colombian government would at least have some incentive to improve the situation in Colombia and to go after the paramilitary groups which continue to haunt that country. The near complete silence about the staggering violence in Colombia is critical in allowing that violence to continue. Indeed, the paramilitaries have always depended upon being able to operate in the shadows, and the US press is more than happy to oblige them in this effort.